Welcome to the Freddy's Farm website! ​Freddy's Farm is a small family farm in Bolton MA. We have been breeding and showing Shetland sheep for over 10 years! ​Besides Shetlands, we also own a flock of cross-bred chickens, 2 horses and 3 angora rabbits. You can see pictures of the whole crew on the photos page. Our farm started off as a 4-H project, and has bloomed into a full-time small business. My sister Olivia and I show our lambs at local shows starting in May, and continue all summer long. 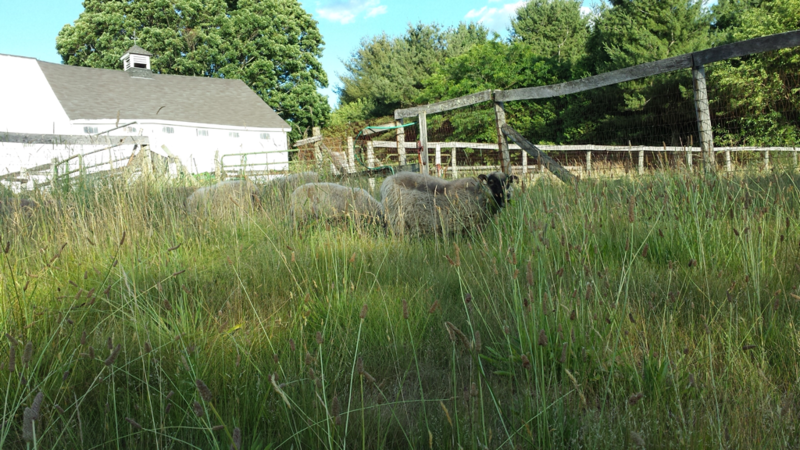 During the summer, we grow to around 35 sheep, and we graze them on various pastures around town. We downsize to roughly 10 during the winter, so we always have someone who needs a home! Check out our ﻿Sheep For Sale﻿ page for updates. Also, check out our Etsy store, you can find our roving, fleeces, and the occasional felted item there. Thank you so much for visiting our site, and feel free to look around! 2018 Breeding season has ended! We have 6 ewes who were exposed to rams, so we're expecting around 10-12 lambs in March/April. Check out our new Breeding groups page for more info! Another successful breeding season has ended! With our planned lambs all coming within 1 week of each other, the one exception popping out in Feb. Check the newborns page for picks. Available 2017 lambs have been posted! Check out our For Sale page for available rams and ewes. After a fitful winter, all ewes have lambed. The final count is 10 boys, 9 girls; all are happy and healthy! Check out photos on the newborn lambs page. As of April 10th, 2016 **LAMBING SEASON HAS ENDED** Our beautiful ewes gave birth to 10 ram lambs and 8 ewe lambs, and everyone is healthy and happy...check out photos of the babies on the newborn lambs page! Meet: Nuss Mathew: Our new breeding ram from Nussbaum's River Bend Farm in NJ. We returned from the NY state sheep and wool festival, with no fleeces (all 15 sold! ), and our lovely new boy! @ Big E 2015, Freddy's Farm swept, winning Reserve Champion Ram, Champion Ewe, and crowd favorite in supreme ewe!! Isabelle also received the Premier Breeder and Premier Exhibitor awards! Woohoo! 2015 LAMBING SEASON HAS BEGUN!! Thanks to the use of C.I.D.R's (progesterone implants) we have super early Febuary lambs! Our own Freddy's Goliad won Best Shetland Fleece, and was pulled into the top 4 line-up for supreme fleece at Wool Week of the Big E! A photo of our brood ewes was the cover of the winter 2014 NASSA magazine! Finally opened our ShetlandDelights Etsy shop! Check out all our hand made products, straight from Freddy's Farm. Andy has arrived!! We also brought home a little black Gulmoget ewe named Nolka! Check them out on the Freddy's Farm flock page.